I love automated QA tools like Runscope. Recently at Intercom I investigated the potential for us to begin running similar tests against our production webhooks offering. 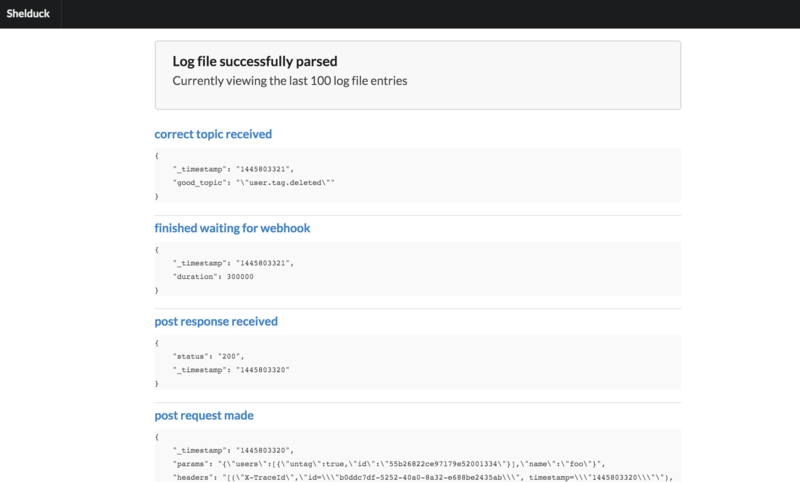 The act of triggering a webhook (via an API action for example) and receiving the webhook are completely separate. Sometimes they can be seconds or more apart. A test framework would ideally abstract this away into a request/response model. QAing webhooks requires a web-server running, configured as a subscription to the system you are testing. Receiving webhooks from a public server requires a public IP. Shelduck spins up Spock servers at runtime, and uses ngrok for ssh tunnelling so you can test against production systems. A lot of the current decisions made around Shelduck are ad-hoc and likely to change. By default Shelduck writes a JSON based logfile at ~/shelduck.log. It provides a Yesod powered webserver on localhost, which parses this log and gives a friendly way to investigate issues. Each block (time descending) represents an event that Shelduck has observed. It is interesting that Pusher are working on something that sounds similar, also in Haskell.